The words ‘bivvy’ and ‘Scottish Mountains’ are not very often found in the same sentence which is a pity because a good bivvy is a truly memorable experience. A bivvy bag is a waterproof cover for a sleeping bag which transforms it into a very rudimental shelter. Space is extremely limited. You’ll fit your sleeping mat to insulate from the ground, sleeping bag, small pillow and yourself into a bag and well, not much else. The word ‘bivvy’ or ‘bivi’ is both a noun and a verb; as a noun it described the bag itself, as a verb ‘bivvy’ is the term given to sleeping out in the open without the aid of a tent in a ‘bivvy’ bag. Bivvying can be used as an exercise in cutting weight from you weekend kit. However, it’s not a survival exercise but it can be if you really want to! I bivvy as a means of connecting with the landscape around me. I love the simplicity of a night on the mountains in a bivvy bag, the closeness to nature and the elements; gazing up at the stars and watching the sky change through the night. I love lying on my front gazing out, watching grasses blowing in a soft breeze on a summit ridge; marvelling at small beetles and spiders which I never knew existed in the delicate mosses which grow on the mountain summits. An evening bivvy can be as exciting as a beautiful day stravaiging over the mountains. I bought my first bivvy bag in Alaska for a summer adventure nearly a quarter of a century ago. The bag was a welcome relief from lugging a tent around on short adventures. However I fell back to relying on the tent when I had no idea what the weather would bring. My current bivvy bag, an Outdoor Research ‘aurora’ bag, is a less ‘flashy’ model than my first bag, not that the simplicity of a bivvy bag could ever be described as ‘flashy’. There is literally no stopping you from where you can bivvy for a night. The footprint of a bivvy bag is small compared to that of either a tent or tarp. I’ve bivvied on summits, on rocky terraces sheltered from a strong wind, in woods, by rivers, behind boulders, in gorges and on a terrace which was dug out from a snow slope. I couldn’t have erected my tent on a lot of these sites. From a performance point of view, however, a bivvy bag has some issues compared to the reliability of a tent or tarp for shelter. Condensation can, but not necessarily, build up on the inside of the bag and make sleeping bags damp, even when the bivvy bag is made from highly breathable Gore-Tex. 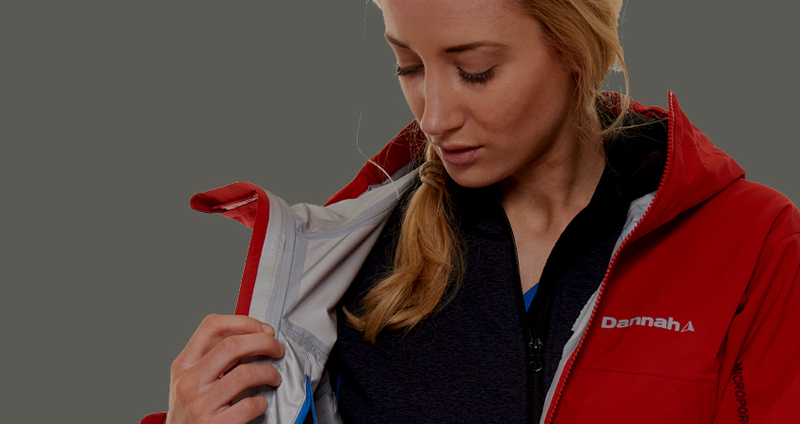 Humidity plays a role in the effectiveness of Gore-Tex. Because of this I use a synthetic sleeping bag. If you’re using a down filled sleeping bag make sure it’s a hydroponic one as damp or wet down doesn’t insulate. It’s worth washing your sleeping bag using a technical wash such as Nikwax Techwash to help maintain the DWR coating so that the outer will shed any moisture which you get on your bag from condensation. 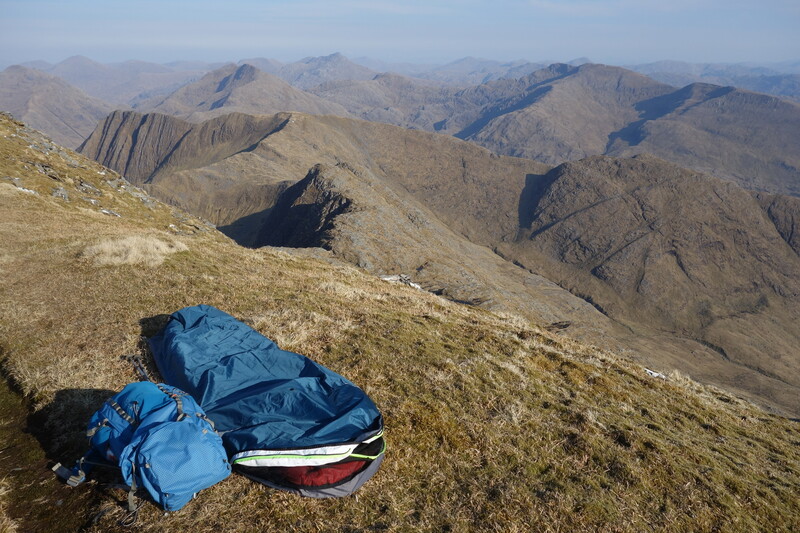 Bivvys in Scotland are best done for one or two nights unless you have means of airing your sleeping bag. One beautiful March day on the Cairngorm Plateau I aired my sleeping bag by hanging it out of my rucksack whilst I walked as I had to cover a lot of miles that day. If the weather forecast is to be good for several days there is no reason why you couldn’t do the entire trip using a bivvy bag. If you are not counting grams but more interested in performance take a tent or tarp instead. If you dislike being in a small space, you’re not really going to like being cooped up in a bivvy bag. My ‘Aurora’ bivvy bag is a half and half bag - Gore-Tex upper layer which is highly breathable and a less breathable but waterproof base. This combination of fabrics makes the bag cheaper than buying a full Gore-Tex bag. E-Vent is another good fabric option if you want to push the boat out. You could use an emergency big orange ‘survival’ bag for an impromptu night out if you wish but you will get damp/soggy from your own condensation on the inside of the bag. If you want a cheap bivvy bag to start you off on your adventures there are ex-Army bivvy Gore-Tex bags which can be picked up quite cheaply on eBay. They are larger in size and heavier than any bags made by Outdoor Research, Rab, Exped, Alpkit or Snugpack. Bivvy bags can be hooped, resembling small tents, which creates a little bit more space around your head to keep any claustrophobic feeling at bay. They can be as simple as a bag with a draw cord to tighten up around your face (ideal if you sleep on your back). My bag has a clam shaped opening. I like this design as I sleep on my side and breathe out of the bag. It also gives my face more protection as I can partially zip up the opening to stop weather coming into the bag which is a good idea for Scotland. You cannot breathe into your bag or you will condensate the inside fabric of the bag even more. If I’m feeling claustrophobic I can wedge my air pillow behind my head to create a bit more room. I’m lucky that I have loops on my bag so I can securely peg it down so I’m not caught unaware with it blowing away when I’m away taking photographs. Very few bags have this feature. Please do not place boulders on top of your bag to hold it down as you could damage the fabric. It’s best to use a comfortable sleeping mat although in very dry conditions it’s possible to sleep on your rucksack and still get a reasonable night’s sleep (been there, done that and did get a good night’s sleep.) In winter you can spend up to twelve hours in the same small space, believe me comfort is paramount! I use a Exped Down Mat UL and can sleep on my front, side or back in complete comfort. To be honest it’s comfier than my bed at home. My sleeping mat is placed inside my bag. 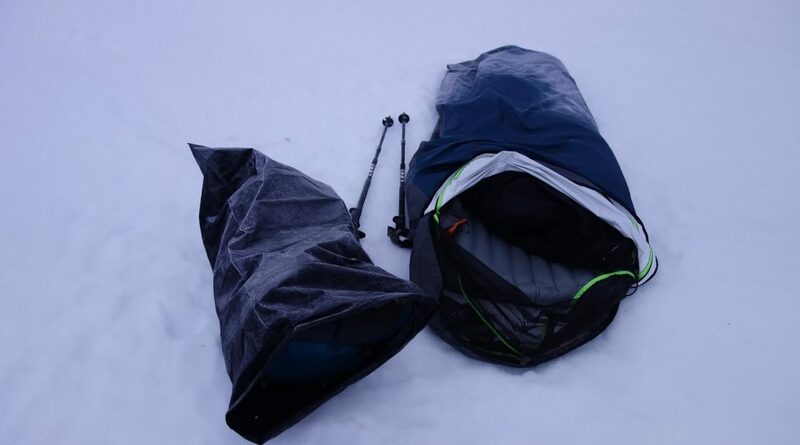 If you are using a full Gore-Tex bag you will sleep in your bag on top of a sleeping mat. If the forecast is for a clearing night and I have to set up in mist or fine drizzle I like to carry a large heavy duty bin bag (rustles less in the wind than a thin bin bag). It’s useful for keeping my kit dry when setting up my bivvy when I’m pulling gear out of the bottom of my rucksack. As I don’t have a rucksack cover I can also use the bin bag to store my rucksack overnight so it doesn’t become sodden from the overnight dew: there is no room in a bivvy bag for storing a rucksack when you are sleeping. Flexibility is the key to having a good bivvy experience. I’m always watching weather forecasts, searching out small weather windows of clear evenings and almost windless weather. A time scale can be as short as the time between sunset and sunrise or as long as a prolonged settled period. Aiming for a bivvy on a mountain summit when the cloud is clearing late in the day is more risky for an adventure as the summit may not become free from cloud. Sometimes choosing to sleep out on a satellite summit will guarantee a cloud free night which has happened quite a few times for me. Note the forecasted wind direction – will it change during the night making your bivvy exposed? You can always use your rucksack to deflect the wind from your head. When I start out walking I never know where on a mountain I’m going to be sleeping for the night. I let local conditions decide for me. On Beinn Fhionnlaidh I found a windless spot on a rocky outcrop, two minutes walking further up or down the mountain and the wind was very strong. One January on the South Cluanie Ridge I found a very small hummock on a bealach which deflected the wind - oh boy, it was a ‘warmer’ spot than a summit bivvy would have been! If I have to walk back to an ideal spot I will do so rather than suffer an uncomfortable night. I try to walk cool before a bivvy so as not to get my clothes damp from sweat as I’ll be sleeping in my day clothes; I’ll make sure the bottoms of my trousers are turned up and tucked away behind gaiters and are not getting wet from any damp vegetation I’ll be walking through. If I’m sleeping wearing my trousers I don’t want soggy trouser bottoms creating a cold damp patch in my sleeping bag. The same rule applies to the rest of my clothes. When setting up for the night I’ll put on extra clothes to retain my body heat: it’s easier to stay warm rather than having to generate heat after being cold. When sleeping I’ll wear just enough clothes to feel comfortable to sleep in; too many clothes can feel colder than fewer clothes. Bringing along an extra pair of dry socks or down boots is a worthwhile luxury. A hat or hood is essential. I carry a small pair of barefoot trainers to change into so I can step easily into my bivvy bag instead of performing an elaborate balancing act trying to take my boots off while stepping into my bag. A couple of plastic bags to cover your socks will also suffice. Over the years I still have not taken to wearing frozen boots first thing on a cold morning. I will either stash my boots away in my rucksack or under my air pillow. Having a good warm meal or food intake before crawling into your bivvy for the night – nobody ever had a good night’s sleep on an empty stomach. I’m starting to think that any luck which may help me to win the National Lottery has been redirected to providing me midge free bivvies. Only three midgies turned up on an August bivvy one evening on Aonach Eagach, the total for an entire summer. A night bivvying in the Scottish mountains could end up being your worst night ever in the mountains. Midgies will start to hatch from early June and stay around till September. The best advice is to keep to high ground and bivvy in a breeze to keep the blighters away. Even then you could still run into some midgies. A bivvy bag with a bug net is a good investment. Repellents like ‘Smidge’ are great for protecting your hands and arms, but a midge net an essential protection for your head – Midgies will crawl up your nose and in your ear canals and I haven’t yet found the courage to spray Smidge up my nose given the advisory notice on the can for where not to apply the repellent. Best of luck! Some of my favourite bivvy nights have been in the winter. The best winter bivvies take a bit more waiting for ideal conditions. I will never forget a fifteen hour day crossing Fisherfield and bivvying next to the Abhainn Gleann na MuiceI gazing up at a snow covered An Teallach which appeared so luminous in the darkness of night. The starry sky was just so beautiful. 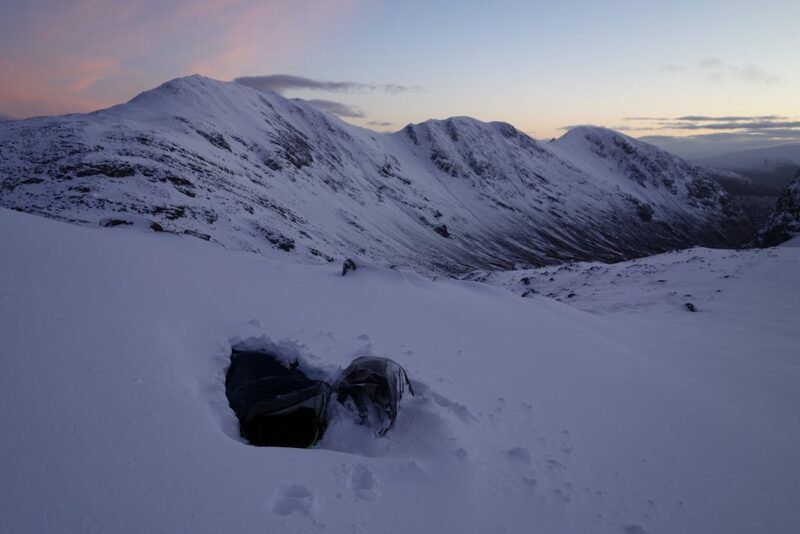 A thaw and re-freeze to consolidate snow can produce a friendlier environment to sleep in without spindrift filling your bivvy bag or making your eyes nip (goggles are useful for a drafty night). Pits dug in snow can provide a good windbreak: stamp down the snow to make a firm platform on which to sleep. Even a frozen loch can be an unusual but acceptable place to sleep providing you a using good insulating mat. The period of the new moon will create a dark sky which shows off the stars to their maximum. Watching a full moon track along a summit ridge in winter is a beautiful experience and enhances the wow factor of a wilderness trip. If you don’t know how to find your way round the constellations a good starting point is to use apps which will identify the constellations for you. For ios devices use ‘Night Sky’, for android use the app ‘Sky Map’. If you like learning from reference books ‘Star Finder for Beginners: A step-by-step guide to the night sky’ published by DK takes you through steps to learn how to find constellations in the sky. I’ve never managed to see the Aurora Borealis in Scotland but there have been a lot of amazing photographs posted on social media. You can get aurora alert updates from the website aurorawatch.lancs.ac.uk/alerts. Now that would be quite a sight to see from the warmth of a summit bivvy! The longer days and better weather is just around the corner. I hope I have given you enough information to inspire you to take your first bivvy. One year I had twenty bivvies in the Scottish mountains - the conditions are there for having lots of top trips. Happy adventures! Bivvy Bagging in Scotland by Hazel Strachan. Dannah introduces Hazel Strachan, Who has so far done the Munro’s 9 times. It’s just before sunrise. The forecasted winds should be gusting 40 mph just now but the landscape is strangely quiet I know it’s been snowing. The distinct sound of heavy snow showers and strong winds which surrounded the small world of my tent for prolonged periods throughout the night has gone. I shift from the warmth of my sleeping bag. Opening the inner of the tent I see that over a foot of snow had blown up against the tent. I stretch and pull the zip on the fly sheet down. Sticking my head out from the tent I smile. There is bright light over by the lochans where a break in the clouds allows the sun to shine through. The world outside is white, nuances of white upon white only broken by the steepness of rocky crags where snow hadn’t been able to settle. I’m camped at a height of 850m on the driest piece of ground I found just before sunset on Meall nan Ceapraichean. I’m spending the weekend indulging myself walking over five Munros from Seana Bhraigh to Beinn Dearg in NW Scotland. Seana Bhraigh is considered to be one of the remotest Munros. I feel excited to be walking over such a remote mountainous area. I’ve been here in summer when it was good to be up high to get out of the heat of the glen; the views over to the coast and the ancient mountains of Assynt stunning for their peculiar weathered shape. The first big snowfall of the autumn will blanket these mountains on my trip. It’s early November and this snowfall seems earlier than previous years on the mountains. A light dusting of snow coated the highest summits. The snow looked grey as I started walking to Seana Bhraigh the previous morning. Cloud skimmed across the highest summits over by the Fannichs and An Teallach to the south. Taking a waterlogged stalkers path I was soon up on high plateau. Strong jagged shadows were thrown onto sunny hillsides; a dusting of fresh snow lingered on the tall shaded crags. The first snow showers were fast approaching from the west as I raced up the last slope of Seana Bhraigh to catch the view from the summit. Oh how the hail hurt my face and stung my eyes! I pulled my hood up and faced away from the onslaught of horizontal maelstrom while I zipped up my clothing. The bank of cloud was deep and enveloped the landscape around me. The bright orb of the sun disappeared and so did the views to the coast and the mountains. About fifteen minutes later the landscape returned to view, whiter than before. For the next couple of hours I picked a route over wet ground standing on tussocks to try and keep my feet dry. Sometimes I retraced my steps which I had just walked to get out of a maze of pools of water. Snowflakes lay on the golden tussocks. As I climbed higher the snowflakes merged with each other to cover the vegetation. The distant horizon to the west turned into a dark steel grey: the land merged with the sky and then the air filled again with snowflakes. I took my gloves off. I stretched out my hand and caught the falling flakes. I caught a fleeting glimpse of their beauty and delicacy before they melted on my warm hand. What a joy! This was the start of winter, a time to marvel at the beauty of the changing season, the newly forming ice on the terraces which I would walk in less than an hour; the sheer beauty of fine snow turning to sparkling glitter as the light from the low sun hit it. And of course walking across the landcape is easiest in first snow. The savageness of winter would eventually dull the small details; movement across the mountains would become arduous. As I reached the terrace on Meall nan Ceapraichean the light changed as I walked into mist. Snow covered all the top surfaces of the rocks leaving the sides of the boulders black where the snow hadn’t covered. If you’ve ever been in mist in snow you will know this light; it’s luminosity so beautiful. This small world with limited visibility is so peaceful. I picked my way up through the boulders, and out onto the summit ridge of Meall nan Ceapraichean. I flick snow onto the upper surface of my boots – it’s a game I play at the start of every winter. I noticed that the bottom of my gaiters and waterproof trousers were frozen . All of a sudden the mist cleared and I look down to a lochan which shimmers in the rose gold light of approaching sunset. I’ve lost track of time. I start to feel a strong wind come up from Gleann na Sguaib. I had to find a sheltered spot for the night to camp because the weather was to deteriorate through the night. The summit dome of Beinn Dearg is shrouded in mist. The long summit ridge of Cona’ Mheall is just visible. 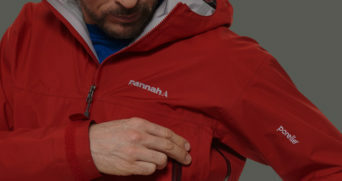 I shake excess snow from the tent and pack it into the top of my rucksack.The temperature is just below freezing. I haven’t worn my boots for long but my feet feel cold from my damp boots. I start moving hoping to warm my feet. Snow blankets everything; a landscape of soft edges. Boulders have disappeared under the lumpy blanket. I step on tussocks to keep out of the deepest snow and away from the boulder strewn slope. As I reached the small lochan on the wide bealach wind howls up from Gleann na Sguaib. I realize how fortunate my choice for a camp had been. Waves race across the water and I climb behind the dyke and into the shelter of the slope. The wind is cold. Sunlight painted the crags a beautiful golden hue which melted into the greyness of the heavy mist on Beinn Dearg. Below me mountainside narrowed into a valley then fanned out into a larger landscape of rolling hills. For the first time I see where the snow line starts. A lot of snow had fallen as I slept soundly in my tent. A wave of excitement runs through me. I feel privileged to be here, to witness the beauty of the experience and the change in the landscape from autumn to winter. The wind picks up snowflakes and swirls them high into the air around me. The snowflakes catch the low sun which change from white to silver. I have no words to describe the beauty of the scene. I stand just looking; this is so beautiful. A terrace leads me through a rocky outcrop over to the long stony slope of Cona’ Mheall. There is a hint of the high grassy edge of a well-worn path which I follow. It’s an easy day for me today in the mountains; well it is on paper anyway. I walked for 8 hours yesterday and today I will be walking for less. The walking is a little slower as I watch where I place my feet on the snowy blanket. I like a game of reading the landscape to find secure placements for my feet. Occasionally I will have to shift my balance to stop falling over as my feet sinks lower into the snow than I’m expecting but this seems rare and more an opportunity to see if I’m paying attention to the landscape. A change in slope texture on Conna’ Mheall gives me an easier line of ascent up onto the ridge. It’s colder now on the summit ridge; the wind is blowing again. I pick a line through the last of the boulders to the summit cairn, weaving between the larger rocks to find flat slabs of rock to put my feet on. Sunlight illuminates the edge of the rolling plateau where I walked from yesterday. It looks so far away as there are no features to create a scale to the landscape, yet it’s less than 5 miles away. I stand behind the summit cairn and enjoy a late breakfast. Wind grabs the snow and spirals it up in huge vortex from below me in the coirie and then reaches a point where it suddenly leaves the spiraling body and dissipates into the air. Looking down the ridge there are many places where snow is being blown from the ridge; the horizon melts into softness. It may be windy but my footprints aren’t filling in very quickly from windblown snow. I am able to retrace my route back up the terrace to the wall and lochans. I rarely have the convenience to follow my own footprints down off a mountain. Oh how easy this is! I can see in my footprints where the weight of my body has been thrown to one side because of the underlying ground; the depth of my footprint an indicator of the softness and depth of the snow. I pick an exposed route up the rocky ridge beside the dyke to ascend Beinn Dearg. I can see the outline of Cona’ Mheall through the gaps in the dyke. The slope in front of me is like being in a maze. There are huge boulders, small boulders, boulders balanced on top of other boulders. I pick a route through the jumble of boulders. I balance on two edges of a side turned boulder and for the first time in the weekend I feel the weight of my rucksack. I’m not tired, just aware of the need to balance carefully on rocks in the wind. I clear the snow from mid-way up a large boulder and step up. The terrain starts to become easier to move through. I can see the turn in the dyke ahead of me, after that I’m on easy open wind scoured ground. I step through a break in the dyke. Snow coats the back of the dyke; snow drifts form another dyke, albeit a soft one with beautiful sculptural lines. Thousands of walkers will have made the same step but I wonder if they ever give a thought to the history of the dyke. The line of the dyke stretches as far as I can see across the summit slopes onto a long open ridge. Its construction is crude; rocks balanced on top of other rocks with no thought given to creating anything neat and artistic unlike that of lowland dykes. In places the dyke is six foot tall – taller than I can lift any weight above my head. It’s over 170 years old, built by hungry men when labour was cheap and the highlands were in the grip of a food famine caused by a reliance on the humble potato. Food was given as wages – a man’s ration for a day was 24 oz. of oatmeal. This dyke will stand for another 170 years as reminder to us that the history behind the story of its construction should never be repeated. The views are expansive from the summit. Cona’ Mheall is now bathing in strong sunlight; rolling snow covered hills merge with the distant horizon; towards Ullapool the sea merges with the steel greyness of the sky. Cloud skims the top of the highest mountains in the Fannichs. One spring morning I stood here watching snow buntings swoop, glide and rise as a united group just above the summit; a timeless moment. The only evidence of wildlife today has been a short trail of ptarmigan tracks near the lochans. All the red deer will now be below the snowline foraging for any greenness amongst the amber coloured deer grass. I’m now down at the snowline. I turn and look back to where I have just come from on the mountain. My footprints are the only ones to disturb the pristine layer of snow; I have had these mountains all to myself for the previous two days. The feeling of remoteness has been exhilarating, the beauty of first snow joyful, peaceful and heart-warming. 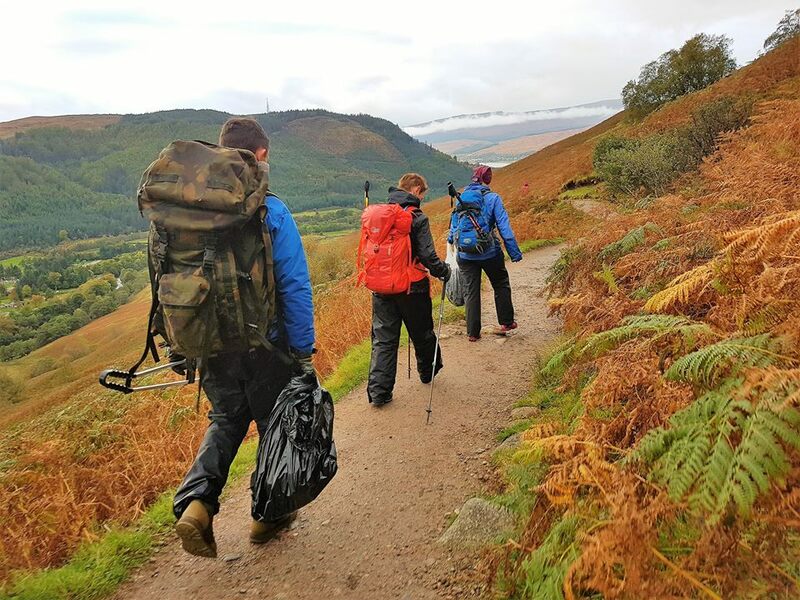 A bag of chewing gum and an empty 1980s packet of peanuts were among 121kg (267lbs) of rubbish found on Ben Nevis. Fourteen volunteers filled 21 bags during a litter pick on Scotland's highest mountain on Saturday. The debris found on the hillside included a peanut packet with a best before date of January 1987 and a ball of chewing gum weighing 4kg (9lbs). It was one of a series of events across the UK organised by the Real 3 Peaks Challenge. Hopefully now, after this huge effort, and the continuing efforts from the Trusts, other charitable organisations, conscientious hill walkers , mountain professionals and land management agencies, these beautiful places will remain free from waste throughout the Winter and into the Spring Time…Until the Summer season starts. Ben Nevis – 120kgs from 14 Volunteers plus members of the public. Scafell Pike- 55kgs from 34 volunteers spilt into 4 parties. Mam Tor & Dovestone, Peak District – 77.5kgs from 17 Volunteers (2 were kids) plus 2 dogs. We do believe that we have been making a huge difference to these wonderful places, being able to get down into the nooks and crannies clearing stuff that has accumulated over many years. We have had lots of support and interaction on the hills with passers by offering to carry a bag for us, and picking litter on our behalf, some even asking to take a bin liner from us so they can carry more. Ben Nevis – Rich Pyne, responsible for the original idea, Mona Pyne, constant support and great ideas. Scafell Pike – Kelvyn James, has been looking after The Pike since Day 1 back in 2013. Always a brilliant job, and a great friend. Snowdon –Kate and Ross Worthington, both been here since Day 1, getting a very thorough job done every year, and they are great with spreading the word about our awareness campaign, thanks guys. Ben Lomond – Mhairi Cameron, new this year, she offered to help out on one of her more local hills, and had managed a stirling job, you seemed to have the nicest weather out of all of us. Lochnagar – Glyn Jones, Head Ranger on the Balmoral Estate and also his first time with The R3PC, looked after this fairly remote hill, giving it a really good going over. Ben MacDui- Chris Taylor, working locally to Cairngorm, offered to deep clean the second highest mountain in the UK. A small but effective team had to deal with 74mph winds, those rubbish bags must of given a real fight! The Peak District- Gill Gillybean Nott, was previously a volunteer on Scafell Pike, this year she was up for deep cleaning another area, with MamTor and Dovestone being selected. Incredibly effective, even pulling out a sleeping bag that was more moss than sleeping bag! Goatfell- Steve Morley, super keen, but was unable to commence this year due to unforeseen family circumstances. Next year Steve, it will all be good. 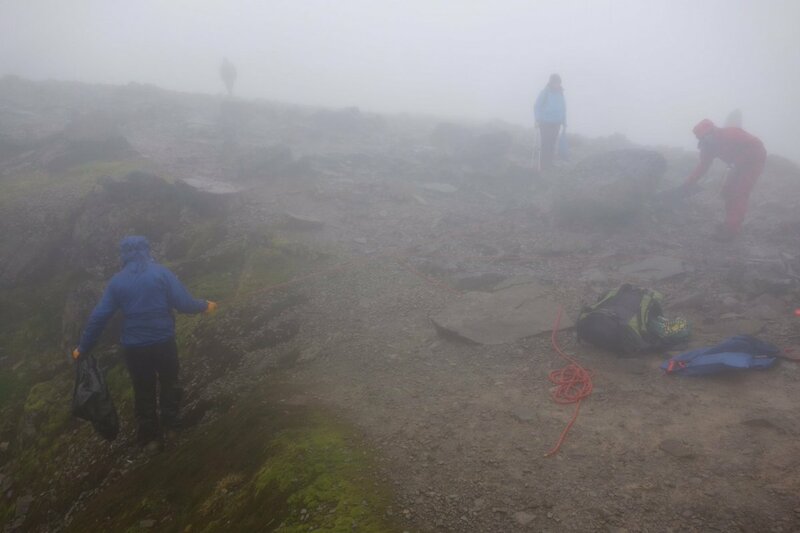 Volunteers pick up 4kg of chewing gum discarded on Ben Nevis. Organiser Rich Pyne said it was "not a bad day out" for the 109 volunteers who took part in the nationwide clean-up." Among the debris were lots of tissues, cigarette ends, banana peel, orange peel, bottle tops, tampons, sweet wrappers, foil, crisp and sandwich wrappers. Some of the 150,000 people who climb Ben Nevis every year even abandoned walking poles, tents and flags on the mountain. 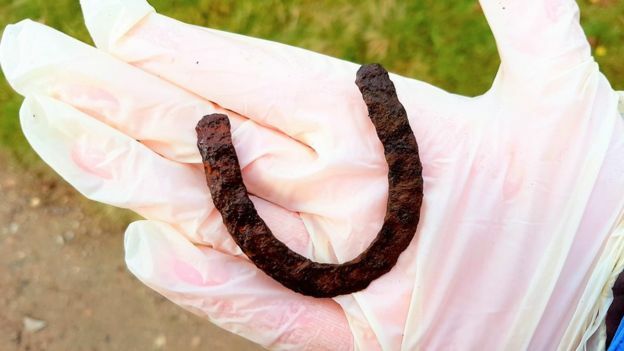 One volunteer also came across a horseshoe they believe belonged to one of the ponies which worked Ben Nevis in the early 1900s. My Pyne told the BBC Scotland website that they generally receive a good reaction from other hillwalkers during their annual litter picks. "They always say thank you, they're always grateful," he said. "Quite often they ask if there's anything they can do and then they might pick up a few bottles on the way down." 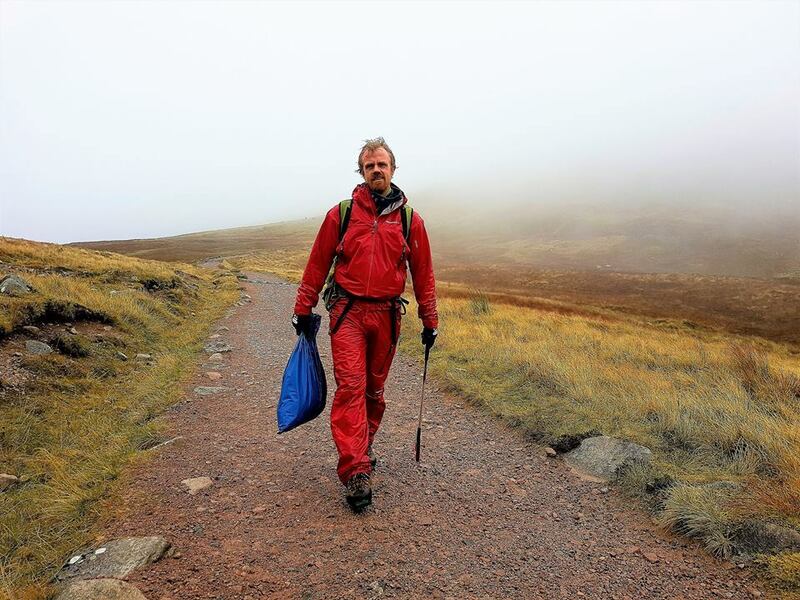 The mountain guide, from Kinlochleven, set up the Real 3 Peaks challenge in 2013, in a bid to clean up the mountains before the winter snowfall.